The company said it would cut up to 500 jobs at its production plant in Southampton, which builds the current Transit. Another 350 jobs will be lost at Ford's other U.K. sites between now and May. 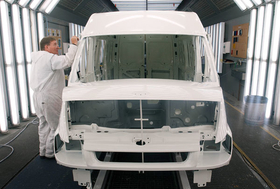 Ford employs 12,900 people in the United Kingdom. The carmaker also will cut about 350 temporary jobs at the Dunton Technical Centre in Essex, where design work is carried out on the new Transit. The Transit was due launch in 2011 but has been postponed to an unspecified date. Ford sold 173,100 Transits in its 19 main European markets last year, down 8,800 from 2007. Ford blamed the economic crisis and falling sales for the job cuts. "As demand across the industry continues to fall, we are facing some immediate and major challenges which require us to take decisive action to reduce all our costs," said John Fleming, Ford of Europe chairman. Ford said it wanted to renegotiate a pay increase agreed with workers last year. "Those companies which act quickly in taking the right decisions will be those who not only survive but who emerge strongest from this deep recession," Fleming said in a statement. Ford workers threatened to strike over the plan. Tony Woodley, joint general secretary of the Unite trade union, said: "These proposals are completely unacceptable and a betrayal of Ford's loyal U.K. workforce." Ford of Europe spokesman Tom Malcolm said the company is discussing cost reductions at its other European sites but had made no decisions. "We cannot say what the outcome of the discussions will be," Malcolm said.